Camille continues her culinary adventures with Gustiamo, goes to visit Mariangela of Acetaia La Cà dal Nôn and discovers the wonderful world of aceto balsamico tradizionale. She is so inspired by the product that is older than she is, that her prose is not only very informative but also poetic! Grazie Camille! Balsamic vinegar is definitely one of the things that first pops into my head when I think of typical Italian food. My favorite after-work snack is fresh bread dipped in olive oil with a splash of balsamic vinegar (aceto balsamico in Italian). Or even better, bruschetta al pomodoro with tomatoes marinated in vinegar. But until coming to Italy, my kitchen contained only run-of-the-mill, industrially produced “balsamic vinegar” from Trader Joe’s. But after my recent visit to La Cà dal Nôn, I now know what I’ve been missing and I don’t think I can ever go back (in fact, now that my Italian adventure is drawing to a close, I don’t know how I’m going to survive in an American grocery store. I might break down crying in the middle of the cereal aisle)! To visit La Cà dal Nôn and experience true “aceto balsamico tradizionale di Modena” (and there really is such a thing as “true” in this case – more on that in a minute) I had to travel to Vignola, a small town between Bologna and Modena, famous for its cherries and, of course, its aceto balsamico. After being picked up from the train station, Zac and I were brought to the Montanari family home for a wonderful lunch and tour of the family acetaia (side note: only producers of aceto balsamic tradizionale can be called an acetaia; industrial producers are known as “acetificio”). The family has been making vinegar since 1883, when the great-grandfather of Mariangela, who with her father now runs La Cà dal Nôn, decided to begin making traditional balsamic vinegar for his family. 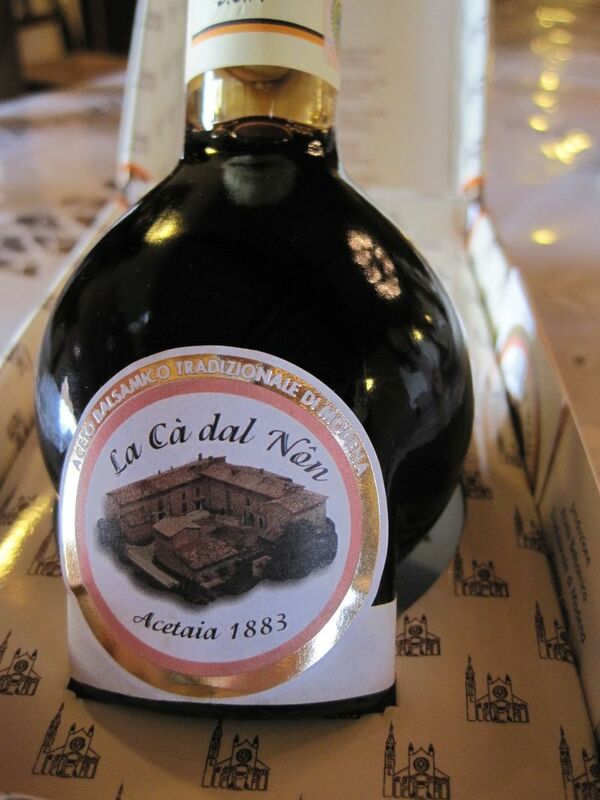 It wasn’t until about 15 years ago that they began selling their vinegar, but the name, La Cà dal Nôn, means “The House of the Grandfather” and is a tribute to the family’s long history of and passion for making aceto balsamico tradizionale. The decision to produce balsamic vinegar as it has been done for centuries must be one of passion – the amount of time, energy, care, and patience that goes into each and every bottle is truly impressive. But it was immediately obvious how much Mariangela cares about her family’s product: she knew important dates in the history of vinegar, the weight of balsamic vinegar in relation to water, how many bottles they produce every year, and so on. And there’s so much to keep track of! First and foremost, the grapes have a large impact on the finished product. Mariangela uses trebbiano modenese grapes (which are white, something I would have never guessed) along with other local grape varieties from the family vineyard. 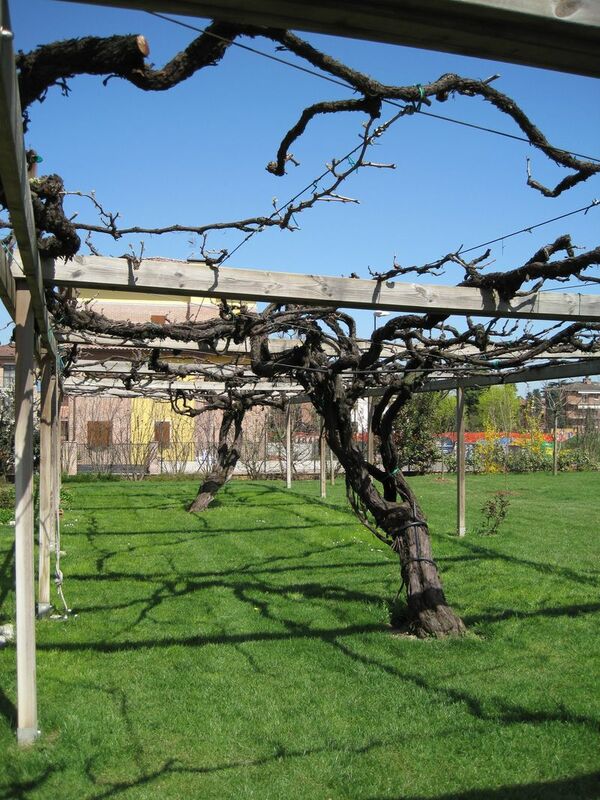 The grapes are harvested as late as possible, normally in the end of September, so that the sugar content is high. The grapes are then pressed and the resulting juice (the “must”) is cooked for around thirty-six hours (depending on the sugar content of the grapes) in a metal pot over a direct flame to evaporate the water and caramelize the sugars. After the cooking process ends, the must is poured into the first barrel in the series to begin the fermentation, acidification, and aging process. Immediately upon stepping into the aging rooms, an intensely sweet yet acidic smell of vinegar hits you. The small rooms are crowded with lines and lines of barrels, each starting with a fairly large barrel and ending with one just larger in circumference than a basketball. The liquid is first poured into the largest of barrels and a percentage is moved each cycle to the next smallest barrel, until reaching the smallest on the line, thereby finishing the process (in other words, the vinegar you buy is taken only from the smallest barrel). These “batteria” (all between 5 and 15 barrels in length) are where the magic takes place: Mariangela explained that the first few barrels, where the newest must is poured, is where the fermentation takes place. The barrels in the middle are mainly where the acidification, or vinegarization, occurs, and the last few barrels are mostly for aging. The vinegar thickens throughout the process, hence the decreasing size. But it’s not just about what’s in the barrel that counts – the barrels themselves have a large impact on the finished product. 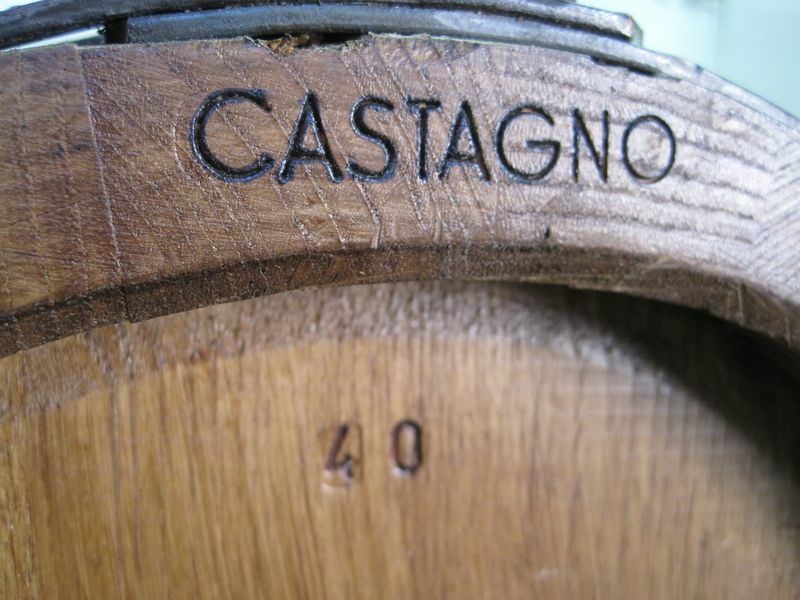 The series can only contain wood native to the Modena region, such as chestnut, cherry, oak, and mulberry, and the order of the barrels alters the taste of the vinegar (the vinegar finished in a barrel made of cherry, for example, is sweeter). A lot of forethought go into making a “family” of barrels, and as soon as the family is conditioned they should always be used together. A lot goes into conditioning the barrels – it takes at least a year and a half of “washing” a new barrel with highly acidic vinegar before it is ready for use. For this reason, the older the barrels, the better the product, and La Cà dal Nôn is still using batteria from the early 1900’s. The care that goes into each batch of vinegar is remarkable. Not only is the aging process extensive (the youngest vinegar must be aged at least twelve years and the extra vecchio – old – vinegar must be aged at least for twenty-five years – it was strange trying something even older than I am! 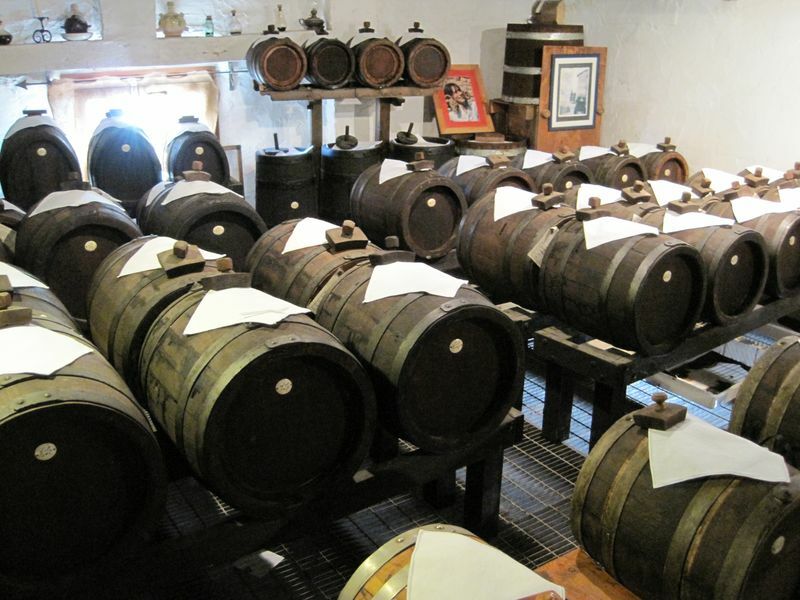 ), Mariangela and her father spend long hours tasting and altering each batch of vinegar, so that by the time it is removed and bottled it has been taste-tested and adjusted at least a dozen times. It takes an informed palate to know what needs changing, and Mariangela has been spending time amongst the batteria since she could walk. Yes, aceto balsamico tradizionale is expensive, but I have no doubt in my mind that this is one of the most time-intensive, difficult food products out there. And it’s worth it – the taste is so unique I can’t even describe it. Maybe most notable is that this vinegar is so well balanced that it’s best appreciated by the spoon full – there’s none of that face-contorting sourness about it. Instead, it’s a burst of flavor that is entirely unique. I’m so, so glad that there are people like Mariangela who love their product so intensely that they can spend years making it perfect. It’s an unforgettable experience to taste La Cà dal Nôn’s vinegar, and I’m really looking forward to taking this piece of Italy at its finest home with me! Previous Post Taking Issue with “Extra Virgin Everything” – Gustiamo Takes Issue!!! it’s always a satisfaction to find people really interested in the product, in its history, in its production and in its quality! p.s. I’m waiting for your recipes to put on the website!